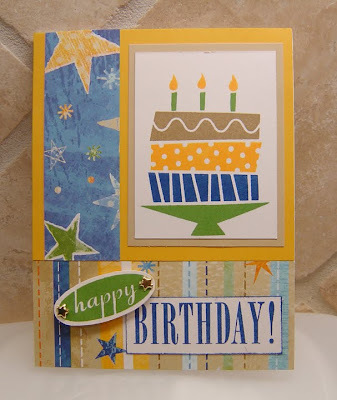 Just needed a quick birthday card for a boy and went looking for inspiration using the August Stamp of the Month. I found that inspiration from Jill Hendricks (who said she was inspired by a blog post from Chris Green). Jill posted a slideshow of an amazing assortment of 30+ birthday cards - all using the same layout but different CTMH papers for each card. Bet you didn't know that CTMH has so many different papers, did you?!?! Check it out HERE. So... here's my card. It's a scraplift for sure... but I like it, so I wanted to post it.